I dug into the loan calculator to fine-tune the dates it selects for ending calculations and determining how current the loan is. I did make some good progress, but there's still more to do there. Get the Next Payment Number and Date to accurately reflect the status of the loan for loans that are behind or ahead, and get the corresponding Amount Due. Have the Amount Due respect the "Overpayments carry over" loan setting. I have a little bit of paperwork today. I'm still adjusting to working from home full time. I made a list on my whiteboard of any features that are not yet in a usable state from the program. As I work through parts of the software, I've been adding things to the list as I bump into them. It’s getting to be a pretty long list! If I treat this list as a product burn-down from scrum, it'll give me a good idea of how much work is left before Moneylender 3 is a fully functional loan servicing product. According to my gross underestimation of the time it'll take to complete the stuff on the board there's about 40 days' worth of full-time development to do on MLP3 to get the beta ready for people to try out. If I were being more cautious, I'd say it's closer to 80 days' worth of development. 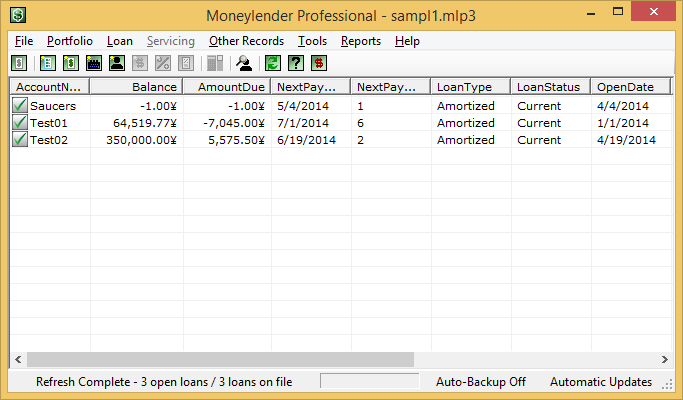 I have about 135 development days before my next contract picks up, so I should be able to release Moneylender 3 beta so people can actually start servicing loans with it. It would be very good to get feedback from users while I still have time to commit to continuous development so any issues could be resolved immediately. 2014 may indeed be the year for MLP3 after all.